Arguably the most important feature when choosing a crowning system is the design itself. Early designs for crowning systems, some iterations of which can still be found on the market today, include stacks of mechanical wedges that can be increased or decreased in height, particularly in the center of the machine. While this design can work, it can lead to a staircase effect. If one stack of wedges is increased in height, the stack of wedges next to it will need to be increased as well. Otherwise the large difference in height will cause inconsistencies in the bend angle. This design requires more time and a skilled operator to be effective. Modern high end crowning systems feature a design that adds crowning in a continuous arc, rather than in isolation like the mechanical wedges. WILA calls its own design the WILA Wave, and it features two opposing waves that are higher in the center where it is needed most and lower toward the ends. This design supports the dies across the whole length of the press brake while gradually increasing the crown in the center. It's also important to note that an effective crowning solution is not a one-size-fits-all approach. Be wary of any manufacturer that doesn't offer custom crowning solutions, as it is often necessary in order to meet specific press brake and press brake tooling requirements and achieve repeatable accuracy. Consider the level of after market and installation service that the company is willing and able to provide, even if the service is offered through your distributor. It's important to have a go-to contact for support for setting up and caring for your crowning system. A crowning system that is not set up properly can produce just as many inaccuracies and headaches as not having one at all. This data may be difficult to find, but try to gauge how many units the manufacturer has sold and are still in use. Sales volume can be another way to gauge overall reputation and quality. Consider the manufacturing process for the crowning system. Is it produced entirely in-house? Manufacturers that control their own manufacturing process have much more control over their product and can typically offer better accuracy and consistency. Whether you're purchasing a crowning system to be retrofitted to an existing machine or outfitted to a new machine, you will need to find one that can be mounted to your existing bed. Most high quality crowning systems should be offered with a range of mounting options, so you can find one that is adaptable to your machine. This one is really important! One continuous curve can't always account for every bend angle inconsistency. If you're investing in a new crowning system, consider one that allows for localized adjustments along the "Y" axis (ram to bed). This will allow you to compensate for any wear on your ram, bed, or tooling. Additionally, some crowning units also offer a built-in alignment system for the "X" axis (machine/tooling center to the back gauge) as an additional feature. Make sure the crowning system you choose will be able to withstand the job requirements. If you're bending medium to heavy gauge materials, you will want your crowning system to be hardened along its working surfaces. Crowning systems are available with a variety of load capacity ratings. Consider your bending applications, and be sure to choose a crowning system that can support your tonnage requirements. Be sure to leave a little breathing room as to not overload your crowning system. Most crowning systems are offered with either mechanical or hydraulic die clamping, while some manufacturers even offer pneumatic (air) clamping. Hydraulic and pneumatic clamping systems provide a clear advantage with regards to speed and ease of use. However, they also come with a higher price tag. Consider the amount of set-ups you need to perform each day before determining which die clamping mechanism to go with. CNC motor driven central crown - A CNC drive can be purchased with a new press brake or integrated with the control on an existing press brake. Manual hand crank with digital counter - A popular option for retrofits. Manual hand crank (front) with analog readout - While not as convenient and streamlined as a manual hand crank, this can be an effective solution for press brakes with limited clearance on the sides where there is no room for a CNC or side-mounted manual hand crank. Most high end crowning systems will offer various optional features to make the operator's job easier, faster, and safer. While these options usually won't be a deciding factor in which crowning system you choose, they are worth considering when you make your purchase. At minimum, your crowning unit should include a cover strip with a scale to make positioning tools correctly easier. Do you need a crowning system? 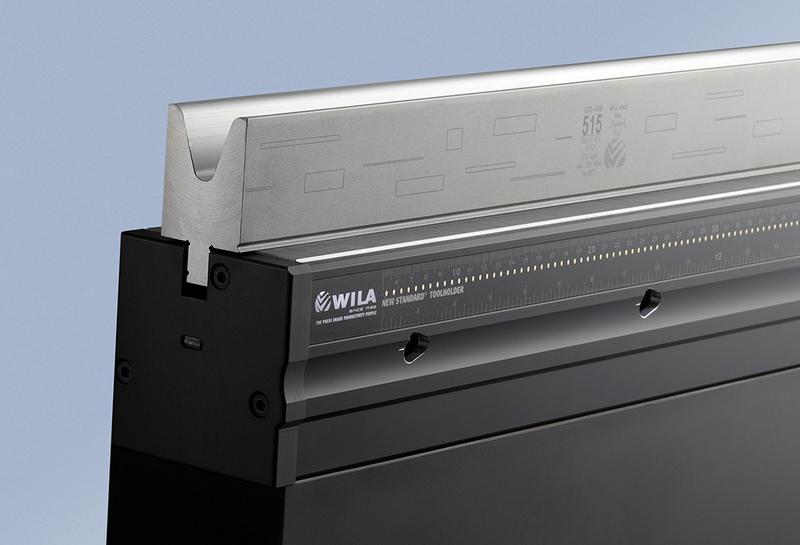 WILA offers a variety of crowning systems with customized solutions and tailored options. Please contact us, so we can help you choose the right crowning system for you.